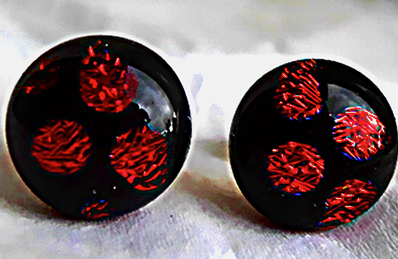 Round stud earrings : Small stud earrings, Black with Red spots of Dichroic glass. The glass pieces are 1cm in diameter and are made of two layers of glass. A layer of Black Dichroic glass with Gold spots, topped with a layer of clear Red glass which make the Gold spots appear Red. There are Sterling Silver fittings, and they come in a Black or Silver card gift box.